Samantha's shape is defined by the use of last-generation OLED mirror panels mounted on a laser-cut mirror stainless steel structure. OLEDs are a new category of light sources that open totally innovative scenarios in the way we design and use light. Composed of light emitting diodes they exploit the quality of "organic” electronics and are formed of super thin films which are crossed by electrical currents that are able to emit light. The OLEDs used in Samantha have a reflective surface that gives the object a magical appearance, decorative and at the same time technical. Thanks to this feature the chandelier reflects the surrounding environment even when switched off creating an unexpected effect turning it into a very shiny object that almost feels alive. 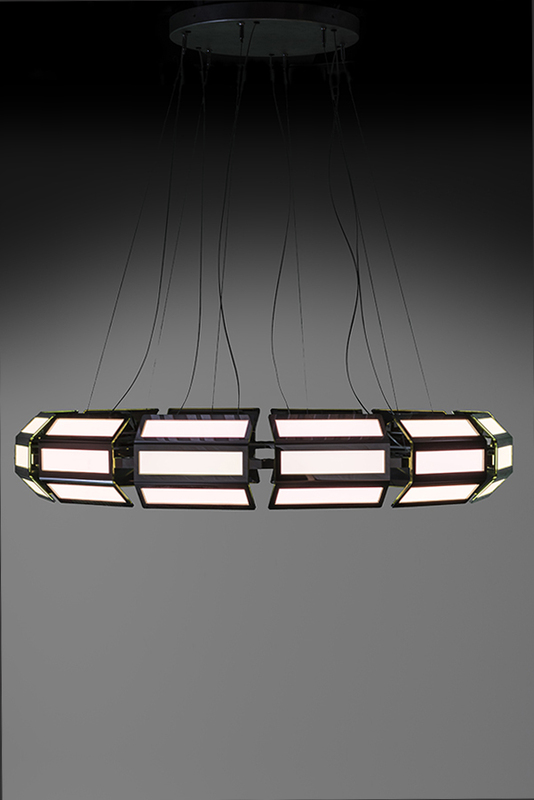 The stainless structure consists of three independent OLED modules that assembled in series allow to create different versions of the chandelier that can be adapted to specific requests both for private and contract customers. Samantha's name is a nod to the Italian astronaut Samantha Cristoforetti who immediately evokes a spirit of innovation and technological experimentation as well as a typical aesthetic dimension of the aerospace world where structure, electronics and volume are indivisible. The project was born from a friendship but also from the desire to share and exchange different skills in order to obtain a result that is bigger than the sum of the individual contributions.